Yellow Ostrich will release their new album Cosmos on February 25th via Barsuk. The alternative/indie rock band has premiered the song “Shades” which you can stream below, and will be heading out on a North American tour beginning February 27th. 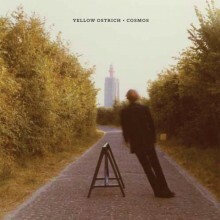 This week New York band Yellow Ostrich announced Cosmos, its new album due Feb. 25 on Barsuk. The first single “Shades” is streaming right here and the band also unveiled its first batch of 2014 tour dates (see below). Before starting on songwriting for Yellow Ostrich’s latest album, singer/guitarist Alex Schaaf moved into the band’s Brooklyn practice space and immersed himself in the study of such astronomers as Carl Sagan and Frank Drake. Keeping up his day job of digitizing vintage home films by day, Schaaf devoted the next 9 months to exploring the depths of the galaxy from a tiny windowless room, whose lighting he synthetically altered to reflect the arrival and passing of daylight each morning and night. Around the same time, Yellow Ostrich drummer/percussionist Michael Tapper ventured into the infinite in a much more literal sense by departing on a sailing trip from Mexico to Hawaii that left him out at sea for nearly a month. Borrowing its title from Sagan’s 1980 PBS series, Cosmos expands Yellow Ostrich’s intensely guitar-driven alt-rock with dreamy electronic arrangements to mirror the mood of Schaaf and Tapper’s retreats away from the everyday world. While the album embodies a sense of both wonder and isolation, Yellow Ostrich’s refined melodies and dense yet delicate sonic textures make Cosmos as powerfully intimate as it is dynamic.